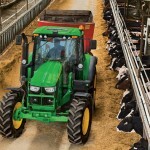 In addition, John Deere has updated its economical 6D Series Tractor lineup that was introduced in 2008. The new 6D Series includes four models ranging from 105 to 140 engine horsepower (6105D, 6115D, 6130D, and 6140D). 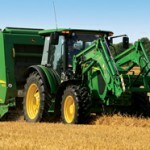 Expanding on its 6R Series Tractors for the row-crop market, John Deere offers two mid-horsepower models: 6140R and 6150R, offering 140 and 150 engine horsepower, respectively. These two models complete the 6R model line-up, giving customers a total of eight different models to choose from in the 105 – 210 engine horsepower range. Both new 6R models come standard with John Deere 6.8L PowerTech PVX engines with Intelligent Power Management that provide an additional 20 horsepower during transport and non-stationary PTO applications. 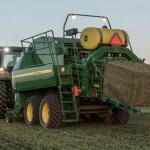 Transmission options include a 20-speed AutoQuad Plus ECO Transmission (standard), 16-speed PowerQuad Plus (optional), or IVT Transmission (optional). 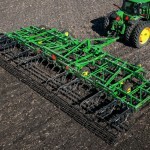 IVT and AutoQuad Plus configurations are available with up to 50K (31 mph) transport speed. 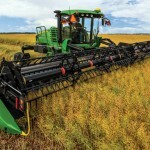 John Deere has also introduced the new DirectDrive transmission for the 6R Series. The newly designed 24-speed DirectDrive transmission combines the handling comfort of an IVT transmission with the power and efficiency of a mechanical transmission. 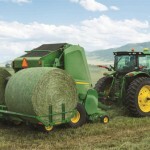 Available on the 6140R – 6210R models, DirectDrive provides the comfort and efficiency for any task at hand.